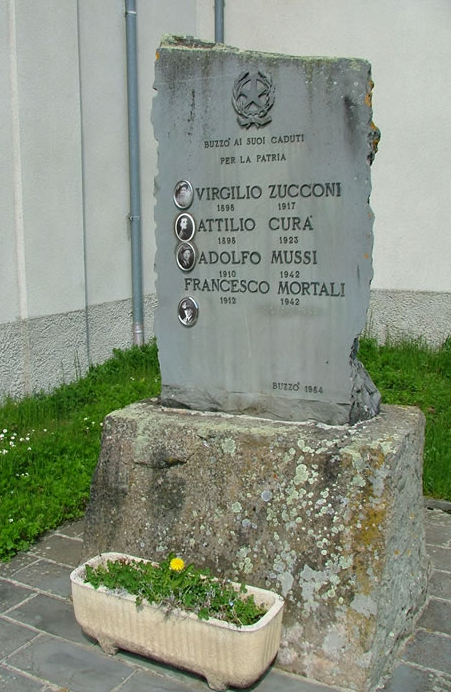 Trying to untangle the social interaction between these families and those of the Ferrari, Cardinali, Delgrosso, Dora, Zanrae and even more families who have intertwined with each other over the centuries in the small hamlets in Italy, and I must say it is quite a challenge. So anyone who can help please be in touch. 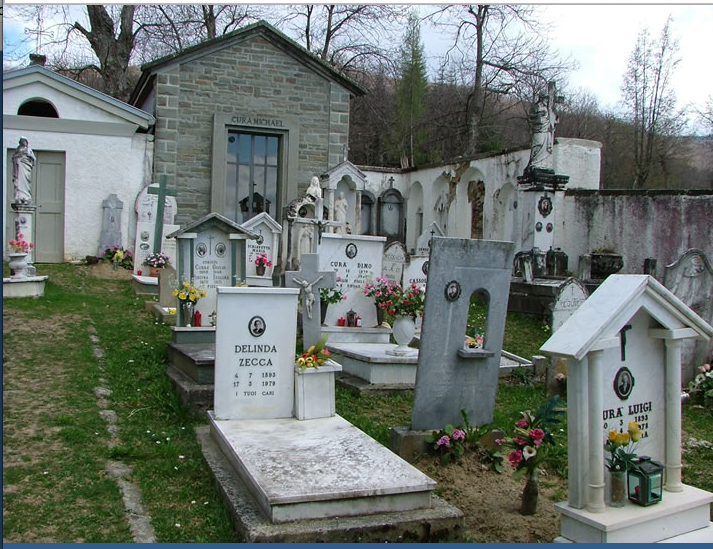 The Brattesani family and the Cura families are related through at least three different lines stretching back of the decades to circa 1870 and beyond. The branches who settled in Perth, Dundee and Cupar in Fife are all most certainly related through brothers back in Parma. 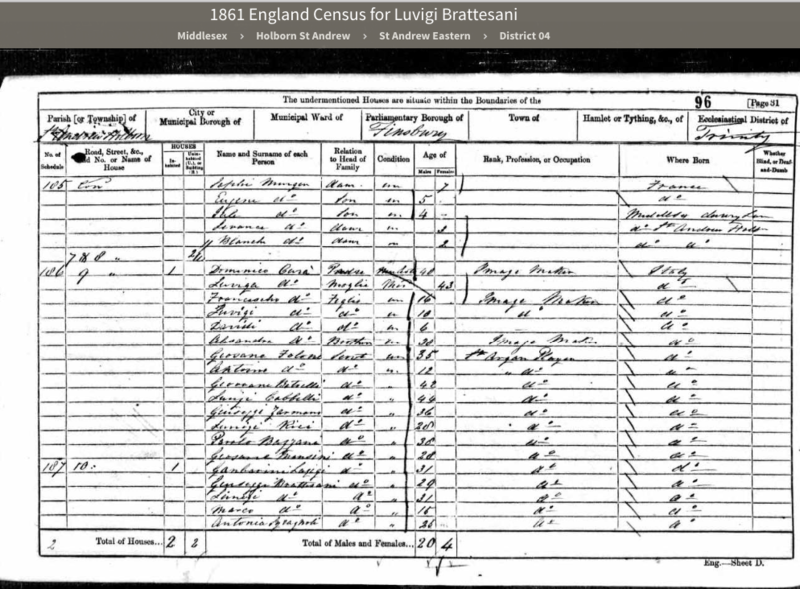 There were Brattesani and Cura found in the 1861 English Census living in London. The Cura family were described as Image Makers or Photographers and the Brattesanis as Musicians. Maria Bratizani as she was documented married Robert Cura in April 1886 in Parma. On their arrival in Scotland Robert Cura found work in the Ice Cream Industry as so many more of the family were at this time. 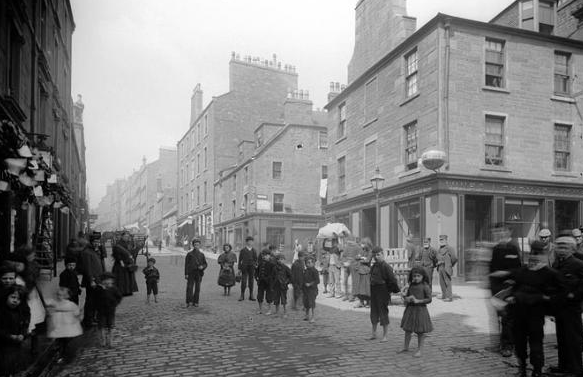 We can find them in the 1891 Scottish Census living at 80 South Street in Perth, Scotland. With him was his wife Maria Bratizani, his sister Maria Cura who had married into the Cardinale Clan. His brother Lui was also working with the family in Scotland. 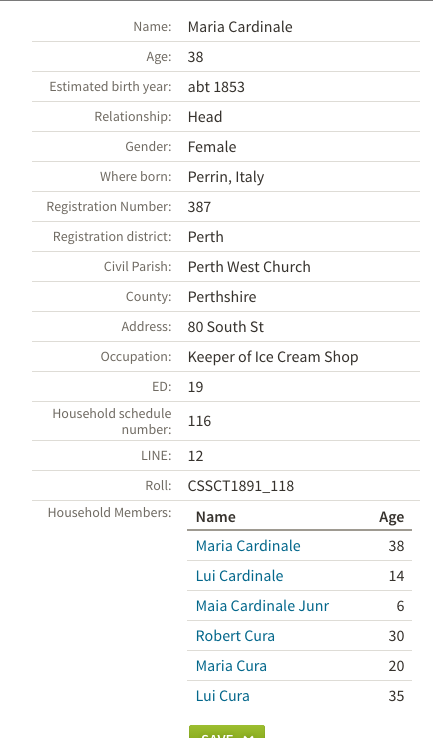 Meanwhile Roberto’s sister Maria Cura and her children Luigi, Angelo and Maria Cardinale were at an address 80 South Street in the same Old Perth. Maria was born circa 1853 in Borgotora. Also in Perth in No. 14 Hospital Street are another family of Curas. Giulio being the head of the family and also a confectioner by trade, his wife Maria, daughters Rosina and Esther and son Adolpho . Daughter Rosina who was 6 in 1891 was born in London, England so this branch of the Cura family had moved up from there. I am still to ascertain relationships between Giulio and the other two Perth Branches. Giovanni Cura was born circa 1865 and he married Luigia Dora in Italy. Their daughter Angela Cura who was born in 1891 married into the Delfillipo clan and also settled in Perth. 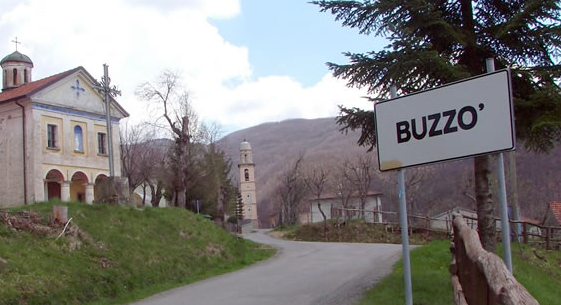 Augustino Cura who was also born in Buzzo, di Albereto circa 1878 married Louise Delgrosso in the little Italian hamlet then they also came to live in Dundee where Bartolomeo was born in 1903. 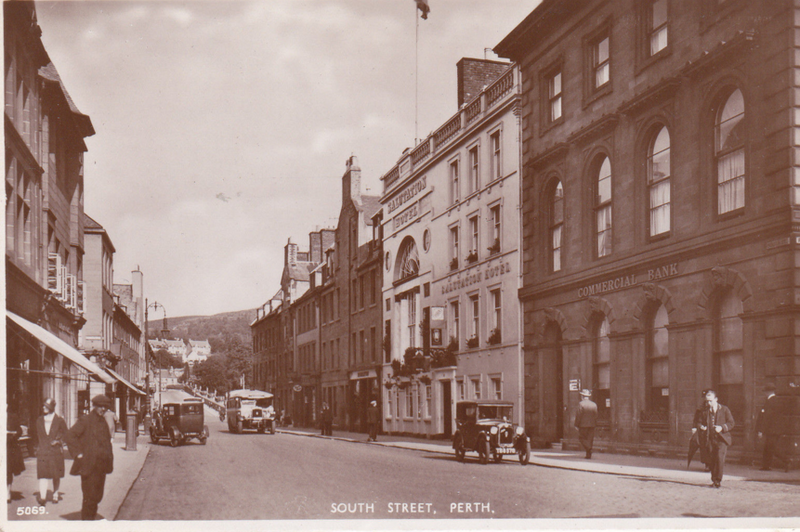 The family then also moved to Perth where Giuseppe was born in 1917. So we have these siblings and cousins all arriving around the same time and settling in Perth Scotland. One line seems to stem from Andrea Cura and Luigia Delgrosso. and their Anthony seemed to settle in Forfar in Angus. 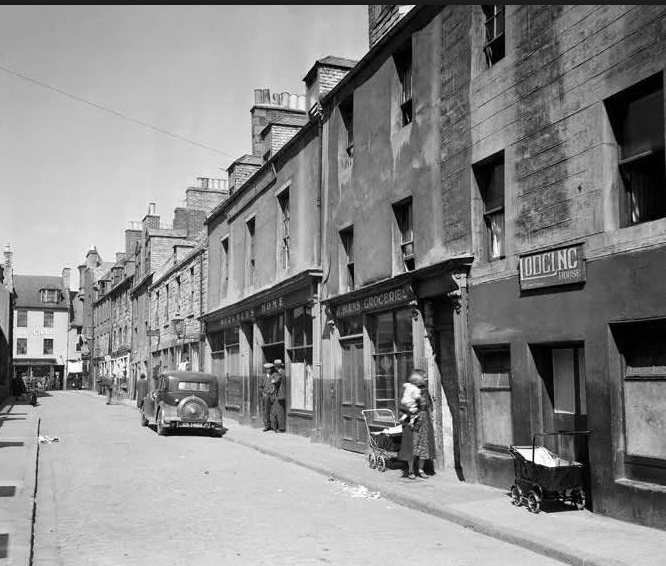 The other line in Dundee is Giuseppe who was also born circa 1880 in Buzzo di Alberto and married there in 1903. His wife was Gevorella Cura. If they were first cousins it would be the reason for them losing so many of their children as infants. They resided in Hawkhill, Dundee.